Chateau / Country House2152 sq. ft. The Wisteria The house is located in one of the most beautiful areas of Tuscany, surrounded by woods, olive groves and vineyards, the ideal place to spend your holidays. The hamlet of about 180 square meters can accommodate up to 8 people, is furnished with attention to detail, according to the taste and style of Tuscan houses. It is composed of a large living room with fireplace, large kitchen with fireplace and bathroom with shower on the ground floor, while the first floor there are 5 rooms that can be achieved by two different scales: one double bedroom and a smaller room with two beds that are served by a bathroom on the ground floor and 2 more large rooms (double) and one with two single beds that are served by a bathroom on the first floor (only services). The garden that surrounds decorated with a large gazebo with table and chairs for dining offers a pleasant outdoor relaxation area. Private parking. the east side of the house adjoins another building. The property 'gli spillocchi' consists of 2 units: the villa 'Il Glicine' and the barn 'Le Rose'. The house is located in one of the most beautiful areas of Tuscany, surrounded by woods, olive groves and vineyards, is an ideal place to spend your holidays. Just 10 km from the medieval town of San Gimignano, 20 km from the beautiful Volterra, while the cities of Florence, Siena and Pisa are about 35/40 km. We were a party of 4 adults and 5 children and the house was a perfect size and layout. The house itself had everything we needed, although it would have been nice if there were some games or books available for general use. The location of the house is fantastic and was within easy driving distance to many of the popular towns and cities in Tuscany. The pool and garden were also a great hit with everyone! I would also like to thank Tina for all her help before our holiday started when she answered several emails from our party! I have given the house only 4 stars as it was very hot and we had to buy our own fans for use at night. We did feel that fans should have already been available in the house (at least they will be from now on!!). We would definitely recommend this house to others, and may even come back ourselves! Thank you! 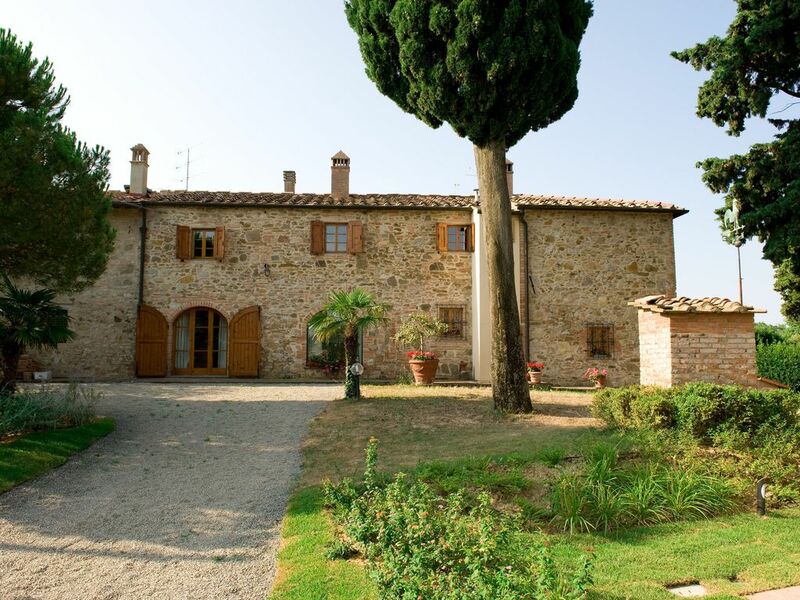 The villa was the perfect size for our group of seven, and located perfectly to explore Tuscany, go wine-tasting in Chianti and visit Florence and Siena. Tina was very hospitable and helpful. With a family of 10 persons, we have stayed in the CASA COLONICA IL GLICINE - perfect size for such a group. The location of the house is very pleasant, just outside of a little village (Gambassi Terme, in the heart of Tuscany), with an extraodrinary scenery from the garden. From here all the important destiantions in the region can be approached easily (40-50 km each). The service provider family was very welcoming and helpful (as we have almost lost our path just before the finish line), they have even escorted us to the house. When arrived, a warm greeting was given to our family, letting us know all the necessary information that is helpful during a stay in Tuscany, then showing around the rooms and facilities. The house and the garden were more than beautiful, not talking about the pool, which was a great help in the hot afternoons. I would recommend this house for larger groups, or for big families with children. Thanks for everything Tina, Maria and Jacobo! We spent a week in Il Glicine, late September; there were 4, all adults (3 of them were seniors). By 'easy reach' I don't mean close to the motorway but placed centrally between the picturesque hills, with many possible little curvy and scenic roads you can take to get to these towns. 5 minutes drive and you can already admire the view to the San Giminiano's towers. We enjoyed touring around every day. The house is decorated with taste and equipped with everything you need, including sugar and spices. The description on the website is accurate. We loved the large dining table in the kitchen (it was too cold to have breakfasts outside). We used 3 bedrooms only in one wing (accessed by one staircase), the 2 other bedrooms are accessible by separate stairs - ideal if you come as 2 families and want to keep some privacy. Need to mention - there are 2 bathrooms in the house but only one wing has a bathroom upstairs. Next to Il Glicine is another smaller house, owned by the same family and sharing the entry gate, garden and pool. It was empty when we were there but it doesn't look like the guests would be a problem, it actually would be nice to say 'hello' each morning. Both houses have separate dining area and there is a sensible distance between them. The advantage is you can hire both for a larger party. And this one is also very beautifully decorated. The weather was very pleasant, no more than 25 degrees C during the day. However the nights were cold enough to cool the water to 19 degrees - we didn't have chance to enjoy the swiming pool. Worth to mention, it wasn't cold in the house at night at all. We had a pleasure to meet the owners - Tina and the family were waiting for us late at night (as we were delayed), they were very welcoming and genuinely cordial as well as available for any help during our stay. Thank you very much for letting us spent such a nice week at your house. We wish you many happy guests! Ruhige Lage, schön angelegter gepflegter Garten, sauberer, täglich geeinigter Pool, Haus top. Es hat uns sehr gut gefallen. Wir haben uns sehr gut erholt, das Haus ist ein super Ausgangspunkt für schöne Ausflüge in der Toscana. Durch die sehr gute Aufteilung und auch Ausstattung war es für uns die wir mit 3 Genarationen den Aufenthalt genossen haben eine super entspannte Zeit. A Gambassi Terme and Montaione (km3) you can find supermarkets, banks, bars, restaurants, pharmacy, Certaldo and San Gimignano, tennis courts, golf-Castelfalfi Montaione and bike rental. In Castelfiorentino Certaldo And there is the railway line Florence-Siena.